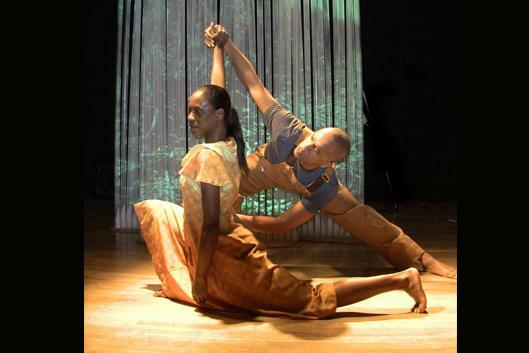 SLIPPAGE: Performance|Culture|Technology announces the revival of CANE, a responsive environment dancework to be performed at the new Rubenstein Arts Center on the campus of Duke University. This performance is free and open to the public. Inspired by Jean Toomer's experimental 1923 text of the Harlem Renaissance, CANE explores memories of African American sharecropping held by a technologically-devised canefield. Created by technologists, dancers, and visual artists, CANE suggests possibilities of shimmering mediated histories mixed in real-time via a specially-constructed responsive environment. Conceived and directed by Thomas F. DeFrantz, CANE suggests ways to rethink how environments hold history, and how technologically-mediated environments can tilt simultaneously toward what has been, and what is yet to be. Performed by Tanya Wideman, Thaddeus Davis, Petra Morgan, Maria Maccaroni, John Green II, and Jade Curtis. Visual Design and Programming by Eto Otitigbe, Music by Tara Rodgers, Sound Programming by Jamie Keesecker, Additional Programming and Sound Discoveries by Jung-Eun Kim and Peter Whincop. Lighting by Jesse Belsky, Costumes by Marissa Erickson. Production Dramaturg: Jules Odendahl-James, Production Management Shireen Dickson.